(Reuters) - The United States has urged countries to think twice before signing up to a new China-led Asian development bank that Washington sees as a rival to the World Bank, after Germany, France and Italy followed Britain in saying they would join. The concerted move by U.S. allies to participate in Beijing's flagship economic outreach project is a diplomatic blow to the United States and its efforts to counter the fast-growing economic and diplomatic influence of China. Europe's participation reflects the eagerness to partner with China's economy, the world's second largest, and comes amid prickly trade negotiations between Brussels and Washington. European Union and Asian governments are frustrated that the U.S. Congress has held up a reform of voting rights in the International Monetary Fund that would give China and other emerging powers more say in global economic governance. Washington insists it has not actively discouraged countries from joining the new bank, but it has questioned whether the Asian Infrastructure Investment Bank (AIIB) will have sufficient standards of governance and environmental and social safeguards. "I hope before the final commitments are made anyone who lends their name to this organization will make sure that the governance is appropriate," Treasury Secretary Jack Lew told U.S. lawmakers. German Finance Minister Wolfgang Schaeuble announced at a joint news conference with visiting Chinese Vice Premier Ma Kai that Germany, Europe's biggest economy and a major trade partner of Beijing, would be a founding member of the AIIB. In a joint statement, the foreign and finance ministers of Germany, France and Italy said they would work to ensure the new institution "follows the best standards and practices in terms of governance, safeguards, debt and procurement policies." In a short statement, China's Ministry of Finance said it welcomed the decision and hoped to receive written confirmation soon. "If all goes smoothly, France, Italy and Germany could formally become founding members of the AIIB two weeks after," it said. Luxembourg’s Finance Ministry also confirmed the country, a big financial center, has applied to be a founding member of the $50 billion AIIB. The AIIB was launched in Beijing last year to spur investment in Asia in transport, energy, telecommunications and other infrastructure. It was seen as a rival to the Western-dominated World Bank and the Asian Development Bank. China has said it will use the best practices of those institutions. The World Bank is traditionally run by a U.S. nominee and Washington also has the most influence at the IMF. The United States and Japan are the dominant members of the Asian Development Bank (ADB). The planned reforms at the IMF would double the fund's resources and hand more voting power to countries such as the BRICS - Brazil, Russia, India, China and South Africa. The adjustment of shares and voting rights was brokered by Britain at a Group of 20 summit in 2010, and European countries ratified it long ago. Lew told lawmakers that the U.S. delay in ratifying the agreement was undermining its credibility and influence as countries question the United States' commitment to international institutions. "It's not an accident that emerging economies are looking at other places because they are frustrated that, frankly, the United States has stalled a very mild and reasonable set of reforms in the IMF," Lew said. Some Republicans have complained the changes would cost too much at a time Washington is running big budget deficits. The reforms have also ran afoul of a growing isolationist trend among the party's influential Tea Party wing. China said earlier this year a total of 26 countries had been included as AIIB founder members, mostly from Asia and the Middle East. It plans to finalize the articles of agreement by the end of the year. China's state-owned Xinhua news agency said South Korea and Switzerland were also considering joining. Chinese Foreign Ministry spokesman Hong Lei would not comment on which countries had applied, and repeated that the bank would be "open, inclusive, transparent and responsible." Washington says it sees a role for the AIIB given Asia's immense infrastructure needs and regards it as a potential partner for established institutions like the ADB. 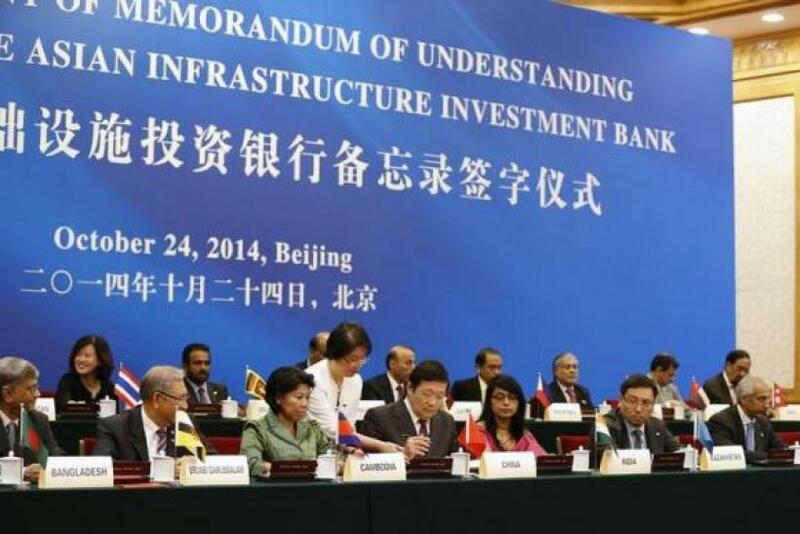 But its strategy of questioning the AIIB's standards has drawn criticism from some observers, who say the administration should have been more accepting of the new bank or offered alternatives within existing institutions. "If you try to fight the rising power's peaceful ascent you sow big problems in the future," said Fred Bergsten, a former top international affairs official at the U.S. Treasury and currently a fellow at the Peterson Institute in Washington.